Last evening Gene walked in the house and said,”It is 4:47 PM, October 5th, and I am officially done making hay for the season.” I wrote it on the calendar. From that statement you can properly gather that he is very ready, very happy and very relieved to be done making hay! What a hay season! Every three days all spring and summer it rained-or at least it felt like it. You need 3 full days to make hay. One day to cut, one to dry and one to rake and bale. In spite of all the rain he only lost two small fields of hay and that was because of baler problems. It takes a lot of hay to feed our herd of 225 brood cows plus young stock-probably 400 head. Gene has to feed hay 6 months out of the year with the amount of cows on our pastures. 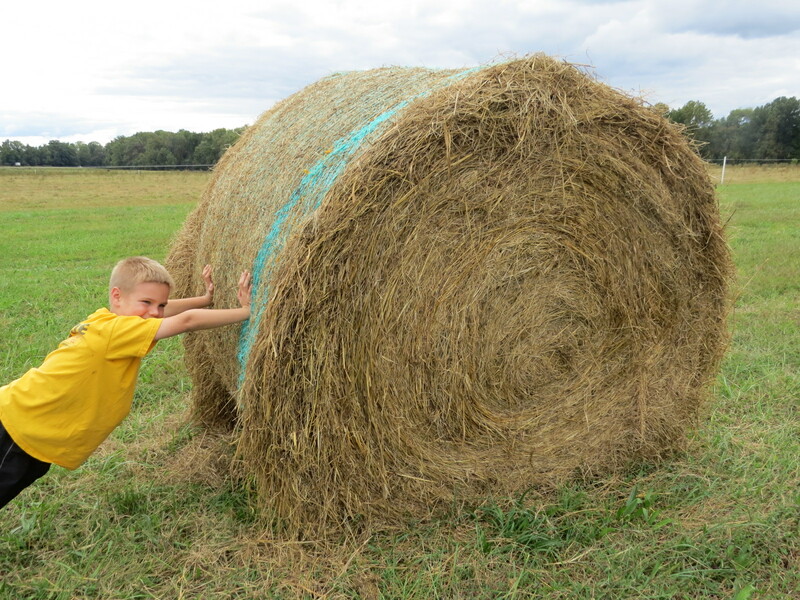 He makes some hay here on the homeplace but most has to be made elsewhere. He figures he made 1975 bales that weigh an average of 1100 lbs on 367 acres of land scattered over the county, 300 of which he made twice. He had to travel 12 miles to the west, 10 miles to the north and 8 miles to the east. Driving on any road in Powhatan these days and especially Route 60 is not fun for any farmer! You do not go during rush hour and then you just pray you make it home safely. 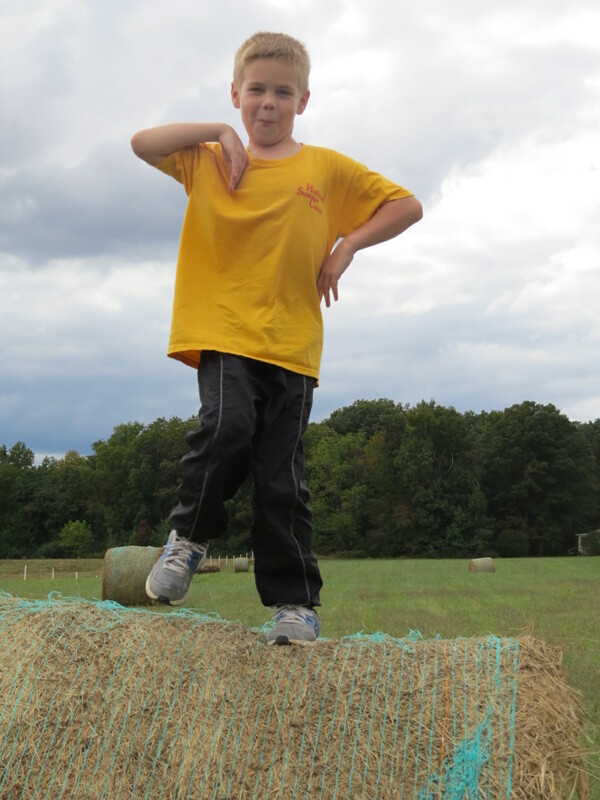 And no, he has not counted every bale-he just knows how many bales he can get from a roll of net wrap! He said to put this into perspective for people who understand square bales… it is like baling 54,000 square bales weighing 40 lbs each or 77 tractor trailer loads of square bales!!! As you can see, Gene was having fun with his stats this afternoon! Our “spare” inventory of bales has been depleted and Gene is hoping that this gives a “buffer” supply in case next year is dry and the hay doesn’t produce as well. Gene said that for hay guys reading this blog they will probably notice that the hay yield per acre is not that great. Most of this is on land that is not fertilized. He is just grateful for all the opportunities he had to cut “unwanted” hay! The other day Sam Powell, our employee who has been very involved in the hay making process, was fretting about getting all these bales home! I told him not to think about the whole picture, just think one field at a time. Depending on which truck and trailer we use, we can haul 16 bales at one time. That is 124 loads of hay. Gene is hoping to have a hay hauling week with extra help and have one tractor loading, another unloading and several trucks hauling. Any volunteers???? I am wondering where they are going to stack all the rolls of hay when they get them home! Gene says they probably will not be able to move them all home this fall but try to get the places the furthest away and where the bales are around people’s homes.